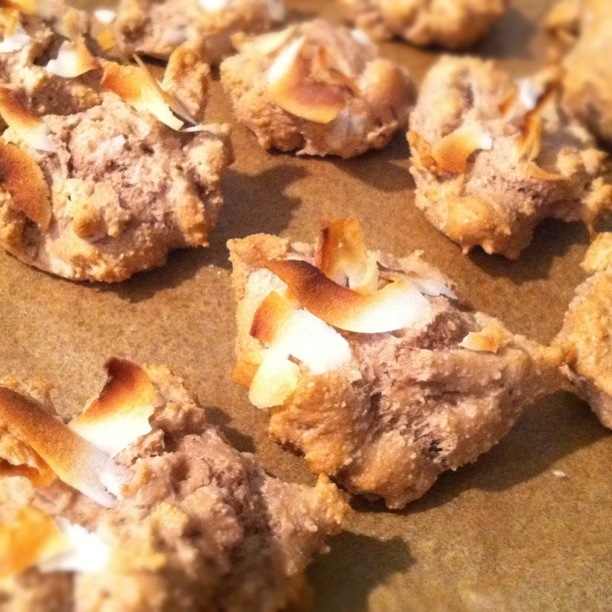 Primal edibles; a new way to look at baking and cooking grain & mostly sugar-free! Quite possibly the BEST muffins I have ever made! I am really starting to fall in love with my new Convection oven. It’s either the oven or it was just a good day for baking. Either way, I think in another life I would definitely cash in on my love for baking. I added Goji berries to these muffins; one because they are super tasty, and two, because they are a widely used Chinese herb. Otherwise known as wolfberry, lycium fruit or Gou Qi Zi (Chinese pinyin), these berries are good for Liver health (in Chinese medicine speak). Without getting into it too much, Gou qi zi helps to improve vision and eye health (the eyes are strongly correlated to your Liver). In addition they nourish the kidneys (responsible in both Western & Eastern medicine as your source of energy – otherwise known as the adrenals), nourish blood and are very moistening in nature. To break it down even further, these tasty little berries treat blurred vision (something I definitely need help with after 3 years of graduate school), anemia, dizziness, sore back and painful knees as well as cough. In addition, they have been useful in managing Diabetes. Hard to imagine such a sweet, small thing packs such a nutritional and therapeutic punch… but believe it! There is such thing as something that tastes good and is good for you at the same time! Mix all your dry ingredients (including the stevia) together in a larger bowl. Beat your eggs and grapeseed oil in a smaller bowl. Add this mixture to the dry mixture, mix together. In your smaller bowl smash your bananas then fold into your batter. 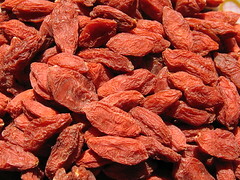 Finally fold in your goji berries (pressed free of excess H2O). Place in oiled muffins tins. Bake for 20-22 minutes (keep in mind I’m using a convention oven, so your time will be up to 10 minutes longer in a regular oven). Makes 6 good size muffins, eat just out of the oven with a pad of Organic butter! Enjoy & let me know what you think! A little sweet for you “primal’s” out there… plus, it’s sugar-free and made out of only almond meal, so dig in. Preheat your oven to 350. Mix the dry ingredients (almond meal, protein, baking soda, stevia & salt) in a medium bowl. In a smaller bowl beat the eggs, and add the Grapeseed oil. Add the egg mixture to the dry ingredients and mix together. Add most of the coconut flakes (leave just enough to top the ‘bites’ before baking) and mix. Cover your pan with parchment paper & spray with coconut oil. Scoop the ‘bites’ onto the pan. Then top them with the remaining coconut flakes. Makes 12-15 ‘bites’. Bake for 8-10 minutes (I used a Convection oven, so 8 minutes was plenty). Your coconut topping should be just browned.